Many readers of this blog would like progress towards the solution of the great questions in climate science. Other readers have stopped by still pondering the basics. Some of those pondering the basics might have read many of the exciting claims on the internet that the “greenhouse” effect can’t exist because it would violate the 2nd law of thermodynamics. It’s not a claim that you find in any books on atmospheric physics by the way, it’s strictly an “internet phenomenon”. Just a few basics in case this is the first post you have read from this site. Longwave radiation from the earth’s surface is absorbed by many trace gases, including water vapor and CO2. The absorption causes these gases to heat up and energy is radiated back out – both up and down. The upward radiation is effectively “no change”. The downward radiation adds to the energy received from the sun and heats up the surface of the earth more than if this downward radiation did not occur. These numbers are global annual averages under a clear sky. Under a cloudy sky the numbers are different but similar – and still the radiation from the surface of the earth is a lot greater than that leaving through the top of atmosphere. For more on this take a look at CO2 – An Insignificant Trace Gas? – Part Six – Visualization and the followup CO2 Can’t Have That Effect Because.. as well as the start of the series on CO2. Many people have said that the numbers are obviously wrong, I’m mixing up solar radiation and longwave radiation, it can’t happen, the temperature varies a lot from equator to poles so that’s why the radiation numbers are wrong.. I even saw one where the guy had 100 watts/m2 going into the atmosphere MORE than was coming out FOREVER. Sharp-eyed readers might notice that I haven’t drawn in the downward radiation. Energy is balanced in the atmosphere because of the downward radiation from the atmosphere (not drawn). This is the “greenhouse” effect. How can a colder atmosphere add heat to a warmer surface? Can a candle warm the sun? There are many popular restatements of the imaginary 2nd law. These two should be a representative sample. And so follows the Q.E.D. claim that the “greenhouse” effect plainly contradicts the second law of thermodynamics. What is the second law? My boring thermodynamics books and I have long since had a parting of the ways, so I looked it up on Wikipedia. Not a 100% reliable source, but the (real) second law is just as I remember it so I looked no further. It’s possible that the imaginary second law has taken a strong hold because anyone who does look it up finds statements like dS/dt>=0, where S is entropy. Wow. Clever people. What’s entropy? How does this relate to candles? Candles can’t warm the sun, so I guess the second law has just proved the “greenhouse” effect wrong..
Again, that seems right and it doesn’t have any entropy involved in the description. I never did like entropy. It never seemed real. Perhaps this formulation has been the inspiration for the imaginary second law. As a not very precise definition many people might read this and think no energy at all can flow from a cold body to a hot body. In fact, no net energy can flow from a cold body to a hot body. In the case of the real “greenhouse” effect and the real 2nd law of thermodynamics, net energy is flowing from the earth to the atmosphere. But this doesn’t mean no energy can flow from the colder atmosphere to the warmer ground. It simply means more energy flows from the warmer surface to the colder atmosphere than in the reverse direction. Another likely reason the imaginary second law has become popular is most people are much more familiar with conduction of heat than radiation. Conduction of heat only appears to flow one way. We’ll do a thought experiment to demonstrate why the imaginary second law of thermodynamics is wrong. It’s simpler, safer, cheaper AND more reliable than assembling equipment. After all, we are going to look at radiation and if we do an experiment we would need to ensure that no convection or conduction was taking place. And the thought experiment will, I hope, be more powerful. Plus it will have the added benefit for those already convinced by the beguiling imaginary second law that they can say “you haven’t proven anything, it’s all in your head” and so the popular imaginary law can live on. In our thought experiment we will consider the sun. It’s hot. It doesn’t conduct or convect any heat outside its immediate surface because space is a vacuum and heat can only travel by radiation through a vacuum. So energy is radiated out from the sun equally in all directions. At a 1000km distance from the sun, we get our measuring instrument out and find that energy radiated is 10,000W/m2 (because I can’t be bothered to work out the actual number). Now we fly in a cold large rock and park it at 1000km from the sun. Energy from the sun is absorbed on this cold rock and it heats up to some equilibrium value where it is also radiating out what it is receiving. The temperature of this large once-cold rock is now a toasty 648K (375’C). All is well with both the real and imaginary formulations of the 2nd law, so far. Now, from a galaxy far far away, we fly in a new star. Before we started moving it we checked the radiation 1000km away from the star and found that it was 11,000W/m2. We are careful in our relocation of this star that nothing changes in its inner generation of radiation. The new star is parked 1000km away from the once-cold rock and 1000km away from the sun. It’s a love triangle. Due to the new star’s welcome appearance, the rock heats up further. It now receives 21,000W/m2. Its new equilibrium temperature is 780K. All is still well with both the real and imaginary formulations of the 2nd law. But now a problem.. the new star is radiating out in all directions. Believers in the imaginary second law have no problem with the idea that the sun receives energy from the new star. After all the sun was a little colder. But what about the sun? It is also radiating out in all directions. Or it was before the new star arrived. Now that the new star is parked 1000km from the sun, squarely in the path of some portion of the sun’s radiation we have to ask ourselves what actually happens? Believers in the real second law of thermodynamics are quite happy. No cognitive dissonance there. The energy from the sun which is incident on the new star’s surface actually increases the new star’s surface temperature compared with what it was before. 11,000W/m2 are flowing from the new star to the sun, and 10,000W/m2 are flowing from the sun to the new star. Some kind of new equilibrium might be reached, but for real second law believers there is no angst. The net flow of energy is from the hotter to the colder. Believers in the imaginary second law, what happens? One obvious suggestion is that the sun’s paltry 10,000W/m2 which was flowing through that exact spot now divert around the new star as if it had some kind of force field. Perhaps all the energy lines completely redistribute so that (depending on the diameter of this new star) about 10,015W/m2 flow in all directions except through the location of the new star. Another obvious suggestion is that the sun “realizes” the new star is there and energy is flowing from the new star to it so just stops radiating in that exact direction. I put “realizes” in quotes of course because we all know the sun is not sentient. It’s just terminology. Some process that drives the imaginary second law will no doubt make this happen. And the most likely suggestion of all is that this radiation from the sun, when it strikes the surface of the new star, just bounces off. Or is absorbed but doesn’t actually heat up the surface of the new star (unlike the inner radiation of this new star which does warm the surface from the inside). I can’t help thinking that all my explanations for the imaginary second law have their own problems. And so I welcome explanations from promoters of the theory for the physical processes that take place near the surface of the new star. Perhaps the problem is in the thought experiment itself. After all, you can’t just fly a star in from another galaxy and park it close to the sun. Barking mad! And so the Imaginary Second Law of Thermodynamics lives on! I think you will find that that is ‘net’ only. Just as in radiation. This is especially obvious when you start throwing phonons into the picture. You are right, I was trying to find the words to explain our common observation without obscuring the matter. But I revised it (“Conduction of heat only appears to flow one way”) and hopefully this will be accurate enough while still conveying the idea. Energy always goes ‘away’. That’s as good an definition of entropy as I’ve found. It’s easy for me to understand that light doesn’t stand there like a rube in the city – it goes anywhere it can as fast as possible. I believe it was Eli Rabett who proposed another possible mechanism for the Imaginary Second Law: the energy from the sun is carrying little flags announcing its cooler source – so the new star knows to turn that energy away. Makes sense to me! Second, while the understanding of the concept of “entropy” has certainly had a checkered past, it is nevertheless a well-defined physical concept: S = k*ln(W). and you might peruse some of the many articles on the topic of entropy written by Frank Lambert, here. This is not really your best post. I would suggest that instead of telling us what those with whom you disagree say, try quoting them directly. You will be just as correct, but it will be much more specific and relevant to what those with whom you disagree actually said. And yeah dave, chaos always increases/energy goes away.. is how my mind perceives it too. never mind, found a calculator, the difference is utterly negligible assuming even at 80km TOA. I guess my blanket can only make me warmer when it gets warmer than my body, then. But since my body is the source of heat, it will never warm the blanket to a higher temperature than its own. Conclusion: blankets are a fraud made by disonest scientists to raise taxes. You wake up on a gorgeous clear morning, just prior to sunrise. You go outside for a brisk walk, and you see frost on rooftops, tops of cars, and the ground — that which “sees” the clear sky. But underneath the tree branches, the ground is bare of frost. Ask yourself, “why?”. And how often do you find frost having formed after a cloudy night? Hi I read this and copied it. The guy mentioned below seemed quite certain about this. Is this statement approximately correct? Dr. Pierre Latour, PhD and PE in chemical engineering and PE in process control engineering. Peter, the statement has its share of truth in the sense that the 14 microns is, indeed, an important CO2 attenuation band (no the only one, though). But the good part ends there. For starters, it´s the Earth emission spectrum that is important here, and not the solar. Greenhouse gases obstruct the Outgoing Longwave Radiation. The 50ppm steps seem quite arbitrary. The function is approximately logarythmic, so the “half as the previous step” statement doesn´t seem right. It´s more like “everytime you double the concentration, you get a similar result”. And of course, there´s the saturation argument that is simply not right. I second the recommendation to the RealClimate link. I can’t say a PhD in Chemical Engineering is the right person to be asking, particularly if they confuse solar radiation and the earth’s blackbody radiation. The wavelengths in question cover a significantly greater proportion of the latter. The absorption at different wavelengths is different. Even though some lines are even saturated at 50 ppm, there are others that let enough through at 380 ppm, 1000 ppm, and even higher that there is still scope for increasing the greenhouse effect at those levels. Anyone who has looked at the absorption spectrum would know this, the absorption range broadens with CO2 concentration. The other thing to remember here is that even if photons of a particular wavelength are almost certain to be absorbed, you can still get a greenhouse increase with CO2 increases as this means you have to go to a higher altitude to give the photon a chance of escaping. Higher altitudes mean lower temperatures, lower temperatures mean less efficient blackbody radiation, less efficient blackbody radiation means the surface has to heat up further to get rid of the same amount of heat. So no, his statement isn’t even approximately correct. The CO2 band is quite extensive. Take a look at Fig 1 and Fig 2 in CO2 – An Insignificant Trace Gas? Part Six – Visualization. You can see the effect of CO2 in downward longwave radiation at the earth’s surface and note how much of this radiation comes from CO2. 99% of solar energy has a wavelength <4um so it's not solar energy. And (because of this) as Alexandre points out, the 14-16um band of CO2 is only important in absorbing terrestrial radiation. Perhaps Dr. Pierre Latour is answering some other issue. The impact of CO2 absorption on solar energy in the 14-16um is indeed totally insignificant. Solar energy in this region is 0.009% of the total solar energy. Or it is also possible that he doesn’t really know very much about atmospheric physics. The earth only absorbs one two-billionth of solar energy so at the earth’s surface the total energy under both curves is comparable. Just put in 5780 for the temperature, and choose “Wavelength” rather than “Wavenumbers” and you can see total energy. Then choose some values for upper and lower limit and you can see the total energy in that range. Then use 288 for the temperature and check out how much in the range. The other aspect of radiative transfer is that absorption of radiation warms up that layer which then re-emits in all directions. Radiation isn’t absorbed like a torch light in sand where once you have a cm of sand no light gets through and that’s it. And watch out for the final part in the “trilogy” about saturation. Spectroscopic detection of different elements of the atmosphere is very cool. Every element has its signature but this has nothing to do with heat. The temperature of a mass of any substance is completely unrelated to a substance’s spectroscopic identity, is that not so? You know, CO2 can be warmer or colder and it does not change its fingerprint. Is the detection of CO2 in the absorption spectrum of our atmosphere purported to have a correlation with temperature of that atmosphere? We all use a uWave oven before and know that the uWave is the frequency of the hydrogen bond of water. We know that pumps energy into water molecules (won’t heat ice, for instance). But no water molecule stays hotter than the soup around it and the soup doesn’t get hot until all the molecules are hot. That’s because no molecule is in a vacuum such that radiation is the only means of heat exchange- i.e., it exchanges energy all the time kinetically, so no CO2 molecule can remain hotter than his neighbors for long. Thus, net input on his signature frequency is dissipated and shared. Any reradiation is therefore a debit on the surrounding atmospheric energy content as a whole, whether CO2 does it on his signature channels or by the standard blackbody spectrum. The energy was provided by the blackbody spectrum of the surface which the CO2 preferentially absorbed certain parts of (if the water didn’t get it). So CO2 has a bit of a special access to certain color of energy radiation but it always has to share it immediately and can’t get itself any hotter unless it gets all its neighbors hotter too. It has to radiate the same spectrum every other molecule does while it hangs around being the same temperature as everybody else. So if the CO2 color would have gotten away to space but instead got stopped by the CO2, then heat is added to the atmosphere and temperature must increase in proportion to the difference. CO2 has added its contribution and there it is, all of it. If, on the other hand, CO2 is just making it possible for convection and turbulence to show more radiant molecules off to space, then CO2 has still done whatever part it does. If it does both things it has done what it does. If it does anything else or different, it did its job already. Judging by observations, it hasn’t got control of anybody’s thermostat and always followed in the last cab while little sea creatures made mountains of paving materials out of it. When you trot up the Spanish Steps you’re treading on prehistoric CO2 by the ton. When the professor scrawls his equations on the blackboard he’s carelessly crumbing ancient CO2 into dust. Trivia: Plants display inferior growth rates at 500ppm CO2 than they do at 1200ppm These are not the most congenial times for plants. Don’t know too much about microwaves (apart from press the numbers to increase the time for cooking and can never set the clock after a power failure). But some threads of what you say are moving in the right direction. A CO2 molecule absorbs some radiation at certain wavelengths – a photon if we get down to brass tacks. This photon moves the CO2 molecule into a new energy state. One possibility is that CO2 could now radiate out a photon at an energy that moves it into a new allowed state (so it has sharply defined wavelengths that it can absorb and emit at). This could be the same wavelength it received the energy at – but doesn’t have to be. The radiation will be in a random direction. But up to around 100km, and especially in the troposphere, what dominates is CO2 sharing this new-found energy by colliding with other molecules. So this part of the atmosphere all heats up together. And all radiate dependent (or not) on the energy states they can move between. So N2 for example, boring molecule, just heats up and doesn’t have much ability to radiate energy out. So let’s suppose magically all the other molecules radiated out energy and therefore had less. N2 would still have the same as before and would continue to share it out – cooling down a little and heating up the other molecules in the process. Lots of molecules all jostling around, all stay pretty much at the same temperature. So back to CO2. Once it has absorbed energy it shares this energy by collision with the other molecules around it. If it only radiated its energy back out – but in a random direction – it wouldn’t have so much impact. What is true for CO2 is also true for any gas in the atmosphere that can absorb radiation. Hi guys thanks for the replies. I read the excellent link from Marco. And Co2 science of doom. From Alexandre’s quote above. Why would the CO2 in the atmosphere not be saturated by the incoming solar energy? And if so saturated how could it obstruct the Outgoing? Why would the CO2 in the atmosphere not be saturated by the incoming solar energy? Take a look at the graph above. Solar energy is the yellow. How much solar energy do you see in the 15um band? I got the feeling that you did not fully understand what the saturation thing is. Since you seem to be willing to learn about it (you read the links), here’s something you could try: it’s a model that shows the behaviour of the outgoing radiation as a function of temperature and greenhouse gases. Try calculating the spectrum for different CO2 concentrations (change the initial 375 ppm and click “submit calculation”). You’ll see that with as little as some 30 ppm the big CO2 “bite” in the middle of the spectrum is already as deep as it gets. That means the band is saturated. The flaw of the skeptic argument here is that, even though the band is saturated, the attenuation goes on when you increase the concentration, now widening the “bite”. Try playing around with it a bit. For higher concentrations you can’t easily spot the difference visually, so you’d want to keep track of the Iout figure, just above the graph. Thanks again for the replies my ignorance knows no bounds. This continues to be a good web resource. The articles continue to be useful, and comments are open and responded to honestly. If only realclimate.org had set out to be similarly honest, open, and inclusive. Thanks for coming along when you did. ClimateGate revealed how Phil Jones and company suppressed research that they did not like. Anyone who has posted a serious (but inconvenient) question on realclimate understands how unwelcome ideas are suppressed there. The IPCC has been caught out in several scandals, mistakes, and outright deceptions. Climate science needs more honest brokers of information such as yourself. Please list the science Jones and company supposedly suppressed. Please list the scandals, mistakes and outright deception of the IPCC. RC is a madrassa. It was conceived as a madrassa. Gavin is ruthlessly devoted micromanager of other people’s thoughts. You go there to get your brain waxed into orthodoxy. You can actually assess sites that purport to be science sites very easily by a simple concordance. Evangelical sites are top heavy with adjectives over nouns. Dead giveaway. Another tip is how many times you see the word ‘we’. Mostly this personal pronoun occurs excessively where indoctrination is taking place. This place is topheavy with nouns – really big ones, too! Given that CO2 is 0.038% pv, it seems to me that CO2 can only heat the atmosphere by a very tiny amount by this mechanism. On the subject of this thread, I also cringe when people invoke the ‘false’ 2nd law. I always use the argument that whilst energy can flow from a cold body to a warmer body, the nett flow of energy is always from the warmer body to the cold body. Thus, the cold body does not warm the warmer body, but only reduces the rate at which the warmer body loses energy. First, thanks for the kind comments on the blog. This, combined with the fact that no one appears to have actually breached the etiquette (everyone has been studying it?) makes it that much harder to snip, chop and delete. We all have our frustrations at “stuff people have done” but other people with a different opinion on “stuff” get upset. And then the fight breaks out. I’ll think about how to update the etiquette. In the meantime, or even if I can’t figure it out, perhaps everyone can stay off the familiar topics of the bad stuff other people did, might have done, are still doing etc. And we can stay on climate science as best we understand it..
Well – the scientific evidence. It’s more useful than imagination. When the idea was first put forward that the earth was a spinning rock hurtling through space at 67,000 miles an hour, it understandably upset a lot of people, and not just for religious reasons. It goes against everything we have experienced. Of course, in these enlightened days we are all very comfortable with it – but only because we are so familiar with the idea. Since we can measure how much heat CO2 and other trace gases absorb and re-radiate and mathematically link all the pieces of the puzzle together there’s no doubt about it. There are many other astonishing facts about molecules. All, when first encountered, seem amazing and impossible. But science can only progress by measurement, theory, and falsification. I wasn’t questioning the radiative properties of CO2, but rather the (size of the) effect of CO2 colliding with other molecules. Sorry, my response wasn’t very precise. Exactly the same goes for transfer of energy to other molecules. We can measure it. The molecules zip around pretty fast. This is why different gases that are well-mixed are at very similar temperatures. Your calculation is spot on. And I do see your struggle to find the mental picture. And we’ll ignore equilibrium because that just gets more complicated as we have to start thinking about energy radiated back out. Let’s say CO2, in a 1000m layer of atmosphere, 1m^2 in area, absorbs 10W for 1 day and redistributes this via kinetic energy transfer with the rest of that 1000m^3 of the atmosphere. How much does that “chunk” (if you don’t mind me using the technical term) heat up? The chunk has absorbed 864,000J = 864kJ of energy. And unscientifically and unethically kept the energy to itself – no re-radiation, convection, etc. Dry air specific heat capacity =1 kJ/K/kg. How much air do we have in this 1000m layer of 1m^2 in area? Depends on the pressure of course. But let’s use approximate surface density – 1kg/m^3. So in 1000m^3 volume, mass=1000kg. Nice. So our 864kJ has heated up the “chunk” by 0.86K = 0.86’C. What is this little cameo demonstrating? The way to think about the atmospheric problem is to consider how much energy CO2 absorbs. It’s not like CO2 has to heat up to some high number (I know you were just doing that to explain the problem) and then share it with the rest of the atmosphere. It continually receives energy and continually shares energy. Imagine the whole chunk of atmosphere is receiving 10W by gentle heating from a large heat element. What would be the effect then? Exactly the same. How much energy is absorbed and shared? Doesn’t matter where it comes from. I used the unreal example above just to try and create a new mental picture. Don’t know whether I have succeeded. Thanks for your patience – I see it now. Think of a house made of one-way mirrored glass. Not particularly difficult, plenty of windows are mirrored on the outside but not mirrored on the inside. If the mirrors are on the outside the house stays cooler. If we reverse the mirrors, the house gets warmer. With the mirrors on the inside the solar radiation comes into the house and has no way to get out except to bounce around for a while and eventually leave via conduction. While most gases are invisible in the visible spectrum, they are not in various other spectrums. Some gases like CO2 act like mirrors on the inside of the house as outgoing radiation is a different wavelength then incoming radiation. Other gases like ozone act like a mirror on the outside of the house. The mirror CO2 acts as would be better described as a screen window. As I re-read this thread, I find myself more, not less, confused. You seem to assert that CO2 is the main ghg. Are you excluding H2O when you say this, if so, why? You seem to assert that CO2 is responsible for most of the greenhouse effect which keeps Earth at its pleasant temperatures. At the risk of redundancy, please redirect me to where you explain this. Please acept my apology in advance for probably repetitive questions. I don’t know where you are getting this from. Not the article? One of the replies? Can you be specific. And no CO2 isn’t the main “greenhouse” gas. Peter317 states: “I always use the argument that whilst energy can flow from a cold body to a warmer body, the nett flow of energy is always from the warmer body to the cold body.” However, while climatologists commonly speak of “energy flows,” this usage is foreign to thermodynamics and can be troublesome. In thermodynamics, a distinction is made between heat, work and internal energy. Thermodynamics is based upon the picture in which there is a body which rests inside its boundary. This body has a property which is called its “internal energy.” Heat is said to “flow” across this boundary. Work is said to be “done” on this boundary. The only type of energy that has the capacity to “flow” is heat. Adding heat to a body increases its internal energy and thus its temperature. The only way in which Earth’s surface temperatures may be raised is by adding heat to Earth’s surface, thus raising its internal energy. In the controversy over anthropogenic global warming, it is at issue whether an increase in the rate of addition of heat to matter in the troposphere via absorption by CO2 in this matter of infrared radiation has the capacity to increase the internal energy of Earth’s surface. The effect in which such an increase does increase the internal energy has been called “the greenhouse effect.” However, there can be no such effect, for it would move heat from relatively cold matter in the troposphere to relatively hot matter in Earth’s surface in the absense of a heat pump and this would violate the second law of thermodynamics. on May 17, 2010 at 7:20 pm | Reply Matt J. But how much of this distinction is due to the original conceptual environment of Thermodynamics, namely, steam engines raising weights, heat CONDUCTED, not radiated, between the boiler and the reservoir? It is conspicuous that the original formulation of ALL of Thermodynamics — not just the three laws — was done neglecting convection, radiation, and even the possibility of transmitting energy from one point to another without a mechanical connection. “Energy flow” is a valid concept. What do you think happens in the thought experiment in the article – under Trouble in Paradise? A consequence from this law is that heat flows only from the hotter of two bodies to the colder of the two. When it flows from the hotter to the colder, this increases the entropy of the universe. Were it to flow from the colder to the hotter, this would decrease the entropy of the universe thus violating the second law. The idea of the second law is captured by the idea that there is a thermal resistor between every pair of material bodies. For a heat transfer problem, a thermal resistor plays a role that is analogous to the role played by an electrical resistor in an electrical problem. Across an electrical resistor is a potential difference. Across a thermal resistor is a temperature difference. Now, to address your “stars” problem, let A designate the sun, B designate the new star and C designate outer space. A thermal resistor links A to B; its resistance is Rab. A second thermal resistor links B to C; its resistance is Rbc. A third thermal resistor links C to A; its resistance is Rca. A and B are heat sources. C is a heat sink. Unfortunately, each resistance varies non-linearly with the temperatures at both of ends of the associated resistor, making the heat transfer problem which you’ve posed quite difficult to solve. One generality that can be made without solving the whole problem is that if the temperature of A exceeds the temperature of B, heat does not flow from B to A. In your essay, I note a tendency for you to speak of “energy flows” and “net energy flows” while not speaking of “heat flows.” I advise against this practice as it increases the ambiguity of your description to a level at which it is impossible for a partner in a conversation with you to know what you mean. In the fields of heat transfer and thermodynamics it is only “heat” that is said to “flow.” It works best for all of us to stick with the languages of thermodynamics and heat transfer so we are all conversing in the same language. Figure 1 of the 2007 IPCC report on “The Physical Science Basis” for IPCC climatology presents a Kiehl- Trenberth diagram that represents the radiation called the “back radiation” as a vector though there is no such vector. The false notion that it is a vector seems to be what leads the IPCC to believe the “back radiation” flows like heat and that its intensity participates in a balance equation. This error is embedded in the IPCC’s thinking about climatology. Beware! So if heat flows from the colder body to the hotter and more heat flows from the hotter body to the colder body then the net flow of heat is from the hotter to the colder. Which increases the entropy of the universe and is consistent with the 2nd law. And therefore, by itself, heat flowing from a colder to a hotter body doesn’t violate any law – we can only comment on it when we know net heat flow. But what I would like Terry Oldberg to focus on is the thought experiment for the moment. Prior to the arrival of the new star, 10,000W/m^2 were flowing through this location. Of course, nothing was absorbed because it was a vacuum. Now the new star arrives. Can you explain what happens to this radiation? Did it (radiation flowing from the old colder star) exist before? -Does it just pass right through? 1. You assert that radiation “flows,” implying that at every point in a radiation field there is a a vector.” This implication is incorrect. At every point in a radiation field, there is a set of rays. 2. You assert that the “net heat flow” is from the hotter to the colder but “heat flowing from a colder to a hotter body doesn’t violate any law.” This is incorrect. Energy that crosses the boundary of a body, which we call “heat,” flows only from the hotter of two bodies to the colder of the two, in the absence of a heat pump (plus the power that would need to be supplied to it). In the language of thermodynamics, the notion of a “net heat flow” does not exist. Thus demonstrating the scientific impossibility of domestic refrigerators. There being nowhere colder for the heat to flow to. Or could this version be imaginary, too? Has it occurred to anyone that there may indeed be a heat pump? Air rises at the equator, moves polewards, and descends, driven by the temperature difference between equator and pole. Heat is absorbed by the Earth at the equator, radiated at the poles, and the air goes round the cycle again. As air rises, the pressure drops and the air expands. Expansion causes its temperature to drop – just as it does in a refrigerator. Later, the air descends, the pressure increases, and the air is compressed. Compression causes its temperature to rise, again, just like a refrigerator. So at first glance, it would appear that there is a heat pump here, that would tend to move heat from a cold place – the upper atmosphere – to a warm place – the surface – in exactly the same way that a refrigerator moves heat from its cold interior to the warm exterior. By successive compression and expansion of a working fluid. This picture is confusing, because in fact the flow of heat is actually the other way (at least, near the equator). Solar heat input at the surface is rising and radiating from the top of the atmosphere – the heat is going from warm to cold. On the other hand, near the poles the air is descending and is indeed carrying heat from the cold upper atmosphere to the (comparatively) warm surface. Without this circulation, Antarctic winters would be even colder than they are. This flow of heat is the power source that drives the ‘refrigerator’. It is a commonplace calculation to show that simply radiating to space, the Earth ought to settle at -18C. So why is the upper troposphere at -54C? What keeps it that cold? The warm surface can occur two ways – either by the ‘layers’ model of non-convecting IR-opaque gases in radiative equilibrium, or by means of this global heat pump. The interesting question is how the cold upper troposphere can occur. How can the two hypotheses be distinguished? In the case of the heat pump or not – obviously we are talking about a closed system. The closed system could be assumed to include the sun. The conceptual problem for people have who have come to believe in the imaginary second law is they are not able to see that heat transfer by radiation can (and does) take place from a cold surface to a hot surface. It’s just that heat transfer by radiation ALSO takes place from the hot surface to the cold surface. And the net effect is obviously in accordance with the real second law. Bringing in the heat pump isn’t going to help or hinder this misconception. They just have a basic misunderstanding of radiation. The zero dimensional or “billiard ball” model simply tells us the average or effective radiating temperature of the earth. This simple model can’t take us any further. For that we need more complex models, 1d models to start with. I hope to cover the temperature structure of the troposphere in another post. Perhaps all of this will become clearer then. That’s fair enough, although I think that if you just wanted to make that point, you could have done it with a much simpler example. Spare stars and planets and whatnot are extraneous detail, that take it outside the everyday familiar. I would have suggested heating two objects in a blacksmith’s forge until they’re red hot, so you can see the radiation, and then put them together. But I’m not sure that the radiation misunderstanding is the real source of the confusion – although it probably explains why they can’t correct it for themselves. Here’s one possible way of looking at it. You start off standing on the surface with no atmosphere, being warmed by the sun. It is a chilly -18C. Now we turn on an extra source of heat from the sky, which warms you by a massive 32C. There is a net transfer of heat from somewhere else to you, for your temperature to be able to rise like that. Intuitive familiarity with heaters – standing in front of a fire glowing red hot, suggests that whatever it is must be a lot hotter than the surface; 30C is a big rise. Except that it isn’t – it’s colder! Intuition says that if you start off in a room at -18C, and somebody puts a wall at 0C nearby, then the radiation from this wall can warm you. But it can only warm you to somewhere between -18C and 0C, it can’t warm you to +14C. The temperature you reach has to be an ‘average’ of your surroundings. The imaginary second law is just a formalisation of this intuition. What they’re missing is that it is not an average of -18C and 0C, it’s the replacement of an average of 6000C and -270C with an average of 6000C and 0C. This is a subtly different error. And it might not be the only one people fall into, either. Until you have actually traced the specific cause of the misunderstandings, explanations aren’t going to convince. I have an additional difficulty with using this example because in my view the ‘downwelling radiation’ explanation is fundamentally the wrong explanation of the greenhouse effect, too. But no doubt we’ll discuss that further when you get around to tropospheric structure. We could talk about semantics for a while, it would be a lot of fun, I’m sure I could tidy up some definitions. Heat is only a subset of energy and so on. What myself (and I’m sure other visitors) would be actually interested in is whether the new star actually intercepts and absorbs any radiation from the sun. Is it possible to answer this question? You assert that the “net heat flow” is from the hotter to the colder but “heat flowing from a colder to a hotter body doesn’t violate any law.” This is incorrect. Energy that crosses the boundary of a body, which we call “heat,” flows only from the hotter of two bodies to the colder of the two, in the absence of a heat pump (plus the power that would need to be supplied to it). In the language of thermodynamics, the notion of a “net heat flow” does not exist. In discourse, an objective is to determine whether propositions are true or false. By a confusing use of terminology, one can seem to prove a false proposition true or a true proposition false. As an aim of discourse is to label true propositions as true and false propositions as false, it is incumbent upon all of the parties to discourse to express their propositions clearly and unambigously. This can be accomplished by use of the terms and phrases of technical English. In technical English, the energy that crosses a boundary is called the “heat.” Under this definition of the word “heat” and under the second law, heat does not flow from cold to hot matter unless pumped. Thus, it must be true that heat does not flow from cold to hot matter within a star or among several of them. In climatology, it is proved that in the atmosphere heat flows from cold to hot matter as “back radiation” and without a heat pump. This second law violating “proof” employs false and misleading semantics that confuse radiation with a radiative heat flow. If one’s purpose is to expose the falsity of this proof, one must first deal with the semantic issues. I have thoroughly enjoyed reading your clear explanations of the science of radiation. They are one of the best that I have read and the examples are excellent. One theoretical model described below bothers me, using your explanation of radiation. Please tell me where I am wrong! A vacuum is maintained in the gap between the two cylinders. If the above assumptions are correct, it would seem that the inner cylinder would warm up as the outer cylinder cools. At equilibrium the inner cylinder would be warmer than the outer cylinder and the heat would have flowed from a cooler body to a warmer one only because the surface area is greater for the outer cylinder. This troubles me, and I would appreciate where the above scenario is in error. Very nice question. Have you confused a few with this one already? Since the outer cylinder has twice the surface area, it is initially radiating twice the amount of heat to the inner cylinder as the inner cylinder radiates to the outer cylinder ID.. But this is not correct. In radiation between 2 surfaces the “view factor” must be taken into account. As the diagram shows, all of the radiation from the inner sphere is received by the outer sphere. But all of the radiation from the outer sphere is not received by the inner sphere. Some will be received on another part of the outer sphere. In the diagram, F(12) is the view factor from 1 to 2 (proportion of radiation from 1 received by 2), while F(21) is the view factor from 2 to 1. No, I have not confused anyone with this question before. The thought came to me while I was reading your article and thinking about how it might apply to different physical configurations. As you can see I am still on the learning curve for the more complex radiation configurations. something absorbing heat giving back heat. Why is it perpetual motion? In the case of the earth’s surface if the sun “turns off” then the earth’s surface cools down to (close to) absolute zero. Perhaps your “feeling” has come from countless people claiming that cool bodies radiating energy (which is an incontrovertible fact) leads to perpetual motion. They probably “felt” it as well. But it’s not anything that can be demonstrated. All bodies radiate energy in proportion to their emissivity x the 4th power of their absolute temperature. If they radiate energy and don’t receive any energy they will cool down – not a perpetual motion machine at all. Also a bit late with comments; found the blog recently. Quote: Believers in the real second law of thermodynamics are quite happy. No cognitive dissonance there. The energy from the sun which is incident on the new star’s surface actually increases the new star’s surface temperature compared with what it was before. unquote. Well, why don’t we bring a small pot of water to boil (100degrees C) then dip it in a large pot of water that has been heated to 90 degrees C. The “sun”, cooler than the new star, being able to heat the new star should predict that the larger pot with 90 degrees C water actually will heat the smaller pot at 100 C, maybe even to 101 degrees C??? yup, I don’t think so either. The boiling pot will quickly cool to somewhere below 100, while the 90 degree pot will slightly heat up to just above 90 (heat transfer from hot to cold, never from cold to hot). One can do this a 100 times, it never fails, kind of like a law, just not sure if this is the second or not. With your experiment, it needs a few minor adjustments to make it relevant. what you need is one pot that is being held at a constant temperature of say 90, and another smaller pot inserted at a lesser temperature(well say 60)… now the flow of heat between the two systems will be both ways, but more will be leaving the warmer system than its absorbing, so it will cool till an equilibrium is found, say 80, with the top pot at 70(as its shallower, more surface area open to atmosphere and loosing heat) Now If you use a butane torch to apply energy to the top pot, whilst not heating it above 80, will it cause the bottom pots temperature to rise? Energy will flow both ways, but the hotter body is emitting more than its receiving. But with a simple hot pot cold pot scenario, the same thing can be observed, by noting temp exchange verse time, as they approach similar temperatures the rate of change slows…. I think that Mike Ewing has already pointed out the problem with your revised experiment, which is why I chose 2 bodies in space with their own power source. Once you have convection and conduction that complicates things. The two stars – through their own internal power sources – are held at largely fixed temperatures. The sun which was radiating doesn’t stop doing so because a new body has appeared in the path of the radiation – obviously. And radiation incident on the new body – the new star – has to be either reflected or absorbed. These properties are always wavelength dependent and sometimes directionally dependent. Perhaps not “obviously” – but it is very basic thermodynamics. thanks for your response. Heartwarming that someone actually reads this and bothers to reply. Took me a few times to read through your revised proposed experiment. I don’t think it materially differs from what I suggested. Wether you drop a cold medium in a warm medium or vice versa does not matter too much. I am with you all the way to the butane torch and if you are willing to stick to the 80 degrees, as you promised (whilst heating not above 80), I have to regretfully disagree quite strongly with the last prediction. The T in the bottom pot will never ever rise over 80. Both pots will neatly stabilize at 80. All your torch will do is heat up your small pot to 80. Actually performing this experiment is a bit hard , considering all the boundary conditions you brought in. Mine was a bit simpler, because it is easy to boil a pot to 100C and then dump it in a slightly colder medium, followed by a quick observation of seeing the boiling water un-boil; you can do this in your kitchen without any specialized thermostatic torch. Maybe this becomes obvious once you make the sun and the new star equally hot at T10,000 . They don’t become both hotter, which is what is predicted in the thought experiment. Well they do become hotter. Why are the 2 stars at 10,000K? Because their internal “power source” matches their radiative output at that temperature. And not because they have an “intelligent” thermostat which regulates them. So assume we have one star with an internal power source that results in its surface temperature being 10,000K. If that isn’t the case, then you have a situation where incident radiation is absorbed but has zero effect. How can that be? How can a body absorb radiation without it increasing the temperature? Why reach the conclusion that a body radiating energy at a steady state temperature will be unaffected by a change in incident radiation? I was afraid you would say that. At least congratulations on sticking with it! I think you just discovered the endless source of energy we are all so desperately looking for. When you expect two equally hot bodies to keep heating each other, where is the limit? and could we not syphon off some off that excess heat. I think you just discovered the endless source of energy we are all so desperately looking for. When you expect two equally hot bodies to keep heating each other, where is the limit? and could we not syphon off some off that excess heat. Where did you come up with the idea that these would keep on increasing in temperature? If that was the outcome, of course you would be right. But that isn’t the case. If you irradiate a body it will increase in temperature (unless it reflects it all), all other things being equal. But it doesn’t go into some kind of thermal runaway. Two bodies radiating due to an internal heat source which are brought closer to each other will move to a new equilibrium temperature. I will provide an example with some numbers to demonstrate that there is no thermal runaway. In the meantime, ask yourself this – if a body receives incident radiation and absorbs some or all of this radiation, how can it not increase in temperature? At the moment, that is what you are thinking. “Radiation is absorbed, but it has no effect”. well, if you have two equally hot bodies that can warm each other, as you suggest (well they do become hotter), then two bodies that heat each other should steadily increase their T and increase their heat flow and so on. As I said, where is the limit? I will be out of the ether for a few weeks, warming up a bit; in the meantime you can maybe tell me what your preferred equilibrium T is and start your thought experiment from there. I am not sure what the conceptual problem is. I do wonder whether it is due to analogies with other types of flow where a potential gradient is involved. Water flows downhill, electrons flow up potential gradients, etc. In these cases the gradient is associted with a force. For water it is gravity, for electrons it is electromagnetism. This is what makes them “potential” gradients. There are other types of gradient which are not necessarily associated with a force. Where is the force in a diffusive process? Take the dispersal of a dye in a fluid. There certainly is an apparent flow down a gradient but there is no diffusive force driving it, in the sense that the molecules of the dye are not repelled from regions of high density nor attracted to regions of low density. One individual molecule of the dye is equally likely to be moving in any direction whatsoever. But collectively the dye tends on average to flow down dye density gradients. But the dye molecules are not driven by the gradient in any way that implies a force. They just meander haphazardly about but the macroscopic result is a flow down density gradients. Why? Because it is the most likely outcome. Given a finite closed system and an infinite amount of time each molecule of the dye is as equally likely to be in any one place as any other. The chances of all the dye molecules in the system all being togther in a small blob is very unlikely, but possible. Equally the chances of all the dye molecules being absolutely evenly distributed is small. There will be regions of slightly higher densities compared to a neighbouring region and these will occur precisely because dye molecules can, do, and must on occasion migrate from regions of lower density to ones of higher density. What has any of this to do with the earth atmosphere interface? Well photons are neither repelled from hot substances nor attracted to cold ones. They carry energy from their point of emission to their point of absorption irrespective of any concept of gradient, heat or temperature. Heating a substance tends to cause photons to be emitted at a higher rate and with higher energies, cooling has the opposite effect. So a hot body in the vicinity of a cooler one tends to produce a net transfer of heat but this is just the difference between the flow from hot to cold and the flow from cold to hot. Blanketting a hot body that is emitting photons by a gas that is capable of absorbing some of those photons and emitting photons in a fashoin that is characteristic of its composition and temperature will cause the hot body to warmer than it would be if the blanket was absent. In that sense it warms the hot body even when most of the photons emitted by the blanket come from regions that are cooler than the hot body there is a real flow of energy to the hot body. The blanket does not care in which direction it emits its photons. It neither knows nor cares that it is cooler than the hot body. Photons are not driven by temperature gradients. But on average there will be a net flux of energy carried by photons down any temperature gradients that exist in the blanket of gas. Why? Simply because it is more likley than the converse. Thanks for sharing your essay. I offer the following critique of it toward the end of ridding climatology of its errors. Your essay muddles concepts of thermodynamics by its unusual and confusing use of the language of thermodynamics. The resulting muddle conceals a false assertion that is made by the essay. This false assertion plays a leading role in climatology as a premise in the argument that is made by the University Corporation for Atmospheric Research (UCAR) for the existence of “the greenhouse effect.” UCAR makes this argument at http://www.windows.ucar.edu/tour/link=/earth/climate/greenhouse_effect_gases.html . of heat-t. Under this condition and only under this condition, the intensity of radiation participates in a heat balance. UCAR uses the false assertion that radiation “flows as a premise in its argument for the existence of “the greenhouse effect.” It follows from this premise that that the intensity of radiation participates in a heat balance. Thus, “back radiation” from absorption of infrared radiation by greenhouse gases in the troposphere flows up a temperature gradient to participate in a heat balance at Earth’s surface. This “flow” cannot exist for it violates the second law of thermodynamics. b) The emission of photons is not isotropic, and that they somehow know only to proceed down temperature gradients, and if the temperature gradient along a straight photon path changes sign the photons are deflected so not to go up a temperature gradient. Which might lead one to wonder how photons emitted from the Earth’s surface escape the thermosphere, and where radiation emitted at the tropopause goes, perhaps it orbits. Back radiation or just radiation does not come as a result of the atmosphere absorbing radiation, it occurs because the atmosphere has a temperature above 0 Kelvin, it matters not what the heat source maintaining that temperature is. Hmmm, what can one say? I think they have got the inverse problem. Perhaps the author thinks that radiation somehow knows to head downwards? Wrong! That more of that radiation is absorbed by the Earth’s surface than escapes into space is very different to “Most, however heads back down towards the surface.”. The use of “most” is also incorrect, “more” would be better. For instance if I had said: “That MOST of that radiation is absorbed by the Earth’s surface.” I would be neglecting the radiation that is both emitted and absorbed by the atmosphere. It is also incorrect for the UCAR author to try to consider the radiation produced by the atmoshpere in isolation, you cannot distinquish photons. More of the IR radiation “in” the atmosphere heads upwards than heads downwards. If that were not so it would be a case of breaking the second law. I’ve almost completed a new article about this, which includes all of the maths to prove it. If 2 identical bodies are an infinite distance from each other with their own internal power source they each have an equilibrium surface temperature. When they are moved to a certain distance from each other they reach a new equilibrium temperature due to the extra heat each is receiving from the other. The only reason you are thinking that they will keep increasing in temperature is you haven’t seen why the body reaches an equilibrium temperature in the first place. And the new equilibrium T depends on the distance between the 2 bodies. Look forward to your comments (when you have the opportunity) on the new post which should arrive today. ..Which might lead one to wonder how photons emitted from the Earth’s surface escape the thermosphere, and where radiation emitted at the tropopause goes, perhaps it orbits.. I think you might have come up with the solution – permanently orbiting thermal radiation. Brilliant. Here’s what must be happening.. The atmospheric trace gases absorb radiation from the surface, then, they first radiate about half upwards because they know that is always colder. But before emitting the other half downwards, they look down to check whether the ground below is hotter. Most of the time the ground is hotter. So obviously they aren’t allowed to radiate in that direction, so they kind of “wheel around” and rather than radiating the rest upwards they emit their their thermal radiation into a kind of “geostationary” orbit. Some kind of orbiting pattern that doesn’t decay. A secret orbit that all of the trace gases know to avoid so that they don’t re-absorb any of this radiation. They don’t want to radiate 100% upwards because that would make the upward radiation from the atmosphere the same as the upward radiation from the surface and make atmospheric physics too simple.. Hmm..
Now I’ve written it, it doesn’t seem as breathtakingly simple and Nobel-prize winning as when I started. (You would be getting the Nobel prize anyway because the orbiting was your idea). I can see why the molecules wouldn’t want to radiate downwards, but why don’t they just radiate all of their thermal radiation upwards to make the average approx 396W/m^2 from the atmosphere the same as from the surface? What is the mechanism here? Of course, just to finish off the story, when the ground is colder than the atmosphere – the common inversion that takes place – then the radiation is allowed towards the ground and they don’t bother with the permanent orbit thing..
And in this situation the ground stops emitting thermal radiation upwards into the atmosphere because it would be going towards a warmer atmosphere. That one’s easy. It just sends it downwards into the earth, could keep doing that for millenia before it made any difference. Perhaps that is why the center of the earth is so hot? But I digress. How does the absorptivity change for a given wavelength? The earth (e.g. sand) can absorb 10um radiation from an atmosphere that is warmer? It can absorb 10um radiation from the sun? But it can’t absorb 10um radiation from a colder atmosphere? Amazing. And not a single G&T apostle has explained it. They should be lining up in droves. Perhaps Terry would like to explain it. He has the G&T bible and has studied it. All this waiting is killing me. But I know it is going to be worth waiting for. Thanks for your reply of May 12, 2010 at 10:54 am. You seem to believe there is a dichotomy between the existence of the back radiation and the flow of this radiation. There is not this dichotomy for there is a third physically realizable alternative. Under this alternative, the back radiation exists but does not flow. That an entity “flows” implies that this flow may be represented by a vector. Given that the flow is of electromagnetic radiation, this vector is called a “Poynting vector.” Gerlich & Tscheuschner provide a graphical proof ( http://arxiv.org/abs/0707.1161v4, p.20, Figure 3 ) of the assertion that a Poynting vector does not generally exist at every (x, y, z) space point in a radiation field; instead, a set of rays exists at every such point. As a Poynting vector does not generally exist, radiation does not generally flow. For example, it does not flow when the associated radiation field is isotropic. Are you saying that for electromagnetic waves the Poynting vector can under some circumstances be made to vanish everywhere? And that these circumstances are generally the case? Are you saying that if the average radiative flux across a surface is zero, the Poynting vector vanishes on that surface? Are you saying that a plane EM wave can have some constant Poynting vector, say of value S, and that for a wave of equal amplitude travelling in the opposite diection it is a constant -S and that they cancel out everywhere? EM waves travelling in opposite dirctions to not cancel out nor do the photons associated with them. You simply can not make the fields vanish nor in general their cross product, the Poynting vector. I think you may be mistaking the Poynting vector with its time average. For a vector to average zero over time is not the same as its vanishing. I can not imagine why you have brought up the Poynting vector. For in the case where there are radiation sources on either side of a surface it’s value is the sum of the Poynting vectors due each source. That is, it is the “net” flow. Further it highlights the difference between a small net flow that is due to a small single source on one side and the same net flow that is due to two sources producing waves travelling in opposite directions. In the first case (single source) the Poynting vector oscillates in amplitude but (when not zero) points away from the source at all frequencies. In the second case the Poynting vector can oscillate in both amplitude and direction for each frequency produced by the sources. The time averaged Poynting vector is the same in both cases but the EM fields, and the Poynting vector itself, are quite different between the two cases. Now we are interested not only in the net flow of thermally generated radiation but in the EM fields themselves and the photons associated with them. And whereas the Poynting vector averaged over all light paths connecting the two sources and over sufficient time must point from the hotter source to the cooler source, this does not imply that the EM field generated by the cooler body does not propagate from the the cooler body to the hotter body nor that photons associated with that field are not emitted by the cooler body and absorbed by the hotter body. The second law of Thermodynamics does not preclude EM radiation propagating from a cooler body to a hotter body. Bringing up the Poynting vector only emphasises that the 2nd Law applies only to the time averaged net flows not to the individual photons nor the EM waves that travel between the two bodies. And so we measure this radiation downwards at the surface of the earth, which doesn’t care whether we call it a Poynting vector or not. How did it get to the surface of the earth? And what happens when it irradiates the surface? Please don’t answer by saying the terminology is wrong.. just why it exists as downward longwave radiation with a strong 15um component and what happens when it “reaches” the earth’s surface. on May 17, 2010 at 7:02 pm | Reply Matt J.
I have to agree with the commenter who said “this is not one of your best posts”. You really do spend a lot of time beating around the bush making the matter more confusing instead of less so. Now I have encountered this “imaginary 2nd law” myself on the Internet, espoused by people who really should have known better, people with engineering backgrounds that included at least some Thermodynamics, probably taught from an engineering perspective only, neglecting first principles. I wish I could say I did better than you did in refuting them, but my attempts were filled with a few false starts of my own, and I was reviewing my own knowledge of Thermodynamics at the time. 2) rather than spend so much time trying to make sense of a mistaken idea, please focus on one accurate statement of the 2nd Law, and show how the imaginary one cannot be the same. My personal favorite is Pauli’s reformulation of Thomson (later known as Lord Kelvin) and Clausius (I forget which was which): heat CONDUCTION is an irreversible process, heat generation by friction is an irreversible process. Please note that both of these can be stated and understood without worrying much about entropy, which barely enters into the formulation at all (sneaking through the back door of the definition of ‘irreversible process’). But my personal favorite might still not be the best: I finally found the soundest refutation by relying on the original formulation which relied on CYCLIC processes: I pointed out to the believer in the imaginary law that the REAL law only says there is no CYCLIC process whose SOLE effect is the transfer of heat from colder to warmer. Therefore, in order to show that the “greenhouse effect” violated the 2nd Law, he had to show that it implied the existence of such a process. Of course, he could not do this. 3) There is one big thing you got right in your article, you could put more emphasis on it and axe the focus on the misconception: that one big thing is “radiation is NOT conduction”. So the “common sense” notion that all heat transfer must be like conduction is simply groundless, it does NOT follow from the real laws of physics. But here again, it was the engineering ‘perspective’ that confused my interlocutor, the one who insisted on the imaginary law: he was misled by “Newton’s Law of Cooling”, which they learn in engineering courses, often instead of learning first principles. This ‘law’ is an approximation only, and really DOES make all heat transfer sound like conduction. 4) Both the believers in the imaginary law, and your “Trouble in Paradise” section confuse ‘heat’ and ‘energy’. Now I know that due to the first law, heat IS a form of energy, but they are different: energy flow does not equal heat flow. I think you will be able to make the point of the though experiment in that section by stating more clearly when you are really thinking of which: there is, as you point out, no problem with ENERGY flow from colder to hotter, it is HEAT flow from colder to hotter that has to be explained. As it is right now, I don’t get the point of your thought experiment at all: it looks like a straw-man argument rather than a refutation of the imaginary law. I am hoping that making the distinction between ‘heat’ and ‘energy’ will fix this. 5) Please mark MUCH more clearly when and where you are quoting the imaginary law (or its consequences), and when and where you are stating something that is actually correct: merely repeating their rhetorical questions cannot replace an accurate statement of their misconception. How do mirrors work in all this? Assume I have a concave parabolic mirror at 20C and reflect the sun off it onto a focus. The mirror is very cold. The focus point is very hot. How can a cold object heat a hot object and keep on heating it? I can’t claim to have the best way of explaining things. I’m sure there are better ways and I hope many people take up that challenge. This post is “at a tangent“. For the apostles of the imaginary second law, no amount of explanation will convince them, and that’s fine because I am only aiming at people who are asking questions and seeking climate science understanding. This post aims at one aspect only. If the apostles of the imaginary second law are correct then a hotter body cannot absorb ANY radiation from a colder body. Both of these violate basic physical principles that most people can grasp. Any therefore it gives the inquirer pause for thought. Perhaps the apostles of this movement have misunderstood the actual real second law of thermodynamics? For those climate science seekers.. This fact should be helpful. In fact, not a single apostle has yet even described what happens. Hopefully, this is enlightening to inquiring minds. Of course, there may yet be apostles who will arrive who will reveal all and I am hopeful that day will come soon. But sadly I know that it will not. No one can come up with a believable explanation that a star stops radiating in one direction because a new star has appeared. And no one will come up with a believable explanation that a body can refuse to accept incident radiation because of the temperature of the originating body. Because none of the apostles want to appear like crazy people. And I can understand that. on May 20, 2010 at 1:53 am | Reply Matt J. Thanks, ‘scienceofdoom’, for the reply. I really do appreciate the difficulties of getting through the ‘apostle’ mentality. And I also appreciate that the difficulties you describe are very real. Of course, you are right that there are no believable explanations for stopping radiating or refusing to accept incident radiation. But I think you underestimate the obscurity of the physical principles behind these facts. The ‘apostles’ feel no need to accept these facts. But this is why, rereading your comments, I think I see an even easier attack on their specious reasoning: don’t bother introducing the third, ‘hotter’ body. Stick to the original two, and pose the question: what happens to the radiation from cooler back to hotter? Surely they must both still be radiating, and energy is flowing in all directions. To make it even more realistic, we can assume that only one has an energy source (like the Sun). Since we are still assuming both are blackbodies, radiation from one to the other must be absorbed and converted into heat, so yes, heat IS flowing from colder to hotter — as well as into space. But since the hotter has an energy source, it remains the hotter despite the small flow from the colder. But as I write this, the real problem becomes clearer: as I mentioned before, they are generalizing incorrectly from the heat transfer situation they are somewhat familiar with, that of heat conduction, to the situation they really don’t understand, radiation. For in the conduction case, it really does follow from the 2nd law that heat conduction can only be from hotter to colder: this is especially clear in Pauli’s formulation of the law (as mentioned) “heat conduction is an irreversible event”. No such rule holds for radiation; the 2nd law itself must, of course, still apply, but HOW it applies is not so clear, so they get confused. The sad part is how strongly they prefer their confusion. Would your article be more clear if you homed in on this key point more quickly? In my opinion, yes. In any case, thanks again for taking the time to respond. Without wishing to pour too much more gasoline on the fire, heat conduction also has the same cold-to-hot and hot-to-cold characteristics as has normal radiation. I think you have explained it well, and I think it could be formulated better as you describe – like removing the planet, which is a distraction. But, rather than a pale, slightly improved, imitation, I have an article in the works which covers the subject from a new perspective – Intelligent Materials and the Imaginary Second Law of Thermodynamics – watch out for it. on May 20, 2010 at 6:20 pm Matt J.
on May 21, 2010 at 12:37 am Matt J. Yes, they are, but if we have to resort to something so highly specialized and technical as the kinetics of phonons, then we have already lost the battle: better to stick with concepts more accessible to people with at least a good high school education in science. The classical formulation of the Laws of Thermodynamics almost fits this bill. The quantum kinetics of photons, electron gases and phonons does not even get close. That is why I am stressing Clausius’ and Pauli’s formulations of the 2nd Law, and the fact that they were formulated for simpler circumstances: conduction, convection and mass transfer, NOT radiation. Every attempt to justify the imaginary version of the 2nd law based on either of these formulations must and does fail. The same is true in the case of radiation as it is in conduction, the flow of heat is from hotter to colder but that does not preclude energy flowing the other way. In fact I suspect it is easier to show that energy flows are bi-directional for conduction in gases than it is for radiation. Every time a molecule crosses a boundary it transfers matter (itself) as well as energy across that boundary. If one maintains a temperature gradient at a boundary between two halves of a closed cell containing a gas there will be a transfer of heat and molecules across that boundary. This could not be sustained unless there was a equal and opposite flow of molecules in the other direction. Again that flow can not take place without an associated flow of energy (in order to cross the boundary it must be moving and have kinetic energy). So in the steady state the flows of molecules are equal and opposite, and the flows of energy not quite equal in each direction, due to the difference in temperate between the gas on either side of the boundary. The flow of heat is the small net difference in the opposing energy flows. The flow of energy along a temperature gradient is bi-direction. On average, energy (heat) flows down temperature gradients. If you are saying that in conduction, unlike the case for radiation, the energy flows along a temperature gradient are all in the down direction, I simply disagree. on May 20, 2010 at 6:19 pm Matt J. What is this supposed to mean? One moment, you say it is precluded, the next, you say ENERGY flow it permitted the other way? But heat IS a form of energy — that IS what the 1st law says. Clearly energy is flowing in both directions — and indeed in all directions in the example of stars an planets, the example that lies behind the thought experiment proposed in the article. And as it flows from star to planet, or from star to star, how do you propose to label some of it as ‘heat’ and some as ‘other energy’? It is just an undifferentiated blob of electromagnetic energy until some of it is converted into random kinetic energy of moleclues — heat. In an earlier post, I insisted on the importance of distinguishing between the flow of heat and the flow of other forms of energy, the muddle you have written is an excellent example of why this is important. BTW: since it is an issue of thermodynamics we are considering, NOT gas kinetics, it IS valuable to treat the problem purely from that perspective if possible (and believe it is). That is why I pointed out that the 2nd Law makes a statement about heat conduction, NOT about heat radiation. To make the same statement about radiative heat transfer involves more work, work the ‘apostles’ of the imaginary law cannot do. In particular, how do we then explain the obvious case (already mentioned in this thread) of the mirror, which remains cold, yet allows boiling of water? Surely it is not enough to simply point out that the ultimate source is still the Sun with its high temperature, though that is an important step along the way. For that matter, even in the case of two hot stars of unequal temperature, how do YOU justify the claim that heat flows only from hotter to colder, when radiated energy also flows from the colder to the hotter, and it there absorbed, being converted into — guess what — HEAT? on May 20, 2010 at 1:55 am | Reply Matt J.
BTW: Jerry’s example of a mirror and Alexandre’s example of a blanket are great examples of how a colder object CAN and DOES keep a hotter object from cooling, or even (indirectly) allow a hotter object to become yet hotter. A mirror radiates very little and certainly does not radiate sunlight. There is no flow of heat from the mirror (above and beyonf the pittance it emits) to a hotter body. The reflective light does not come from the mirror, it never enters the mirror, it never leaves the mirror, it is reflected. It does not flow from the mirror to some hotter object. In order for there to be a flow from one object to another, the fist must lose heat the second must gain that heat. Heat is a flow of energy but in order for the laws of thermodynamics to make sense, it must be an average flow, an abstraction, drawn from the net of many individual energy transfering events. The mechanism for heat transfer by conduction only makes sense at the scale of the molecules, heat does not make any sense at this scale. How do I justify that heat only flows from the hotter to the colder? Heat only makes sense on scales great enough for the 2nd law to hold. In particular it only makes sense on the same scales that allows us to talk about hotter and colder. The mechanisms are not worried about the 2nd law, the mechanisms are bi-directional, but with a slight bias that favours flows of energy when averaged over a sufficient number of interaction, or heat, to always flow from the hotter to the colder. In gas kinetics energy flows in both directions, in thermodynamics, it flows from hot to cold. I feel that the distintinction, given that it accounts for how back radiation not only does, but must occur, whilst not invalidation the 2nd law, is kind of basic. The same is true of the radiative case as is true in gas kinetics (which you seemed to disagree with and why I wrote back to you). In both cases the mechanisms are bi-directional with respect to the transfer of energy but the 2nd law still holds. No such rule holds for radiation? Both are bi-directional on the scale of the mechanisms involved. Both are mono-directional on the scale that the 2nd law holds. Where is the difference? The warming of a cooler body by a hotter body by bi-directional flows of radiation is certainly irreversible. So where is the distinction you are drawing? Do you stand by these statements? Do you believe that there can be a transfer of heat by radiation from colder to hotter? Is that the rule does not hold in the case of radiative transfer? that the transfer of heat by radiation is irreversible? on May 21, 2010 at 12:30 am | Reply Matt J. It is true that mirrors radiate very little (an ideal mirror not radiating at all). But you are dead wrong when you say, “there is no flow of heat from the mirror”. Take away the mirror, and the object that was being heated is no longer being heated. Therefore, in at least some sense of the English word ‘from’, heat IS flowing from the mirror in the scenario under consideration, even though its ultimate source is elsewhere. Errors like these are what make a hopeless muddle out of your writing even when, as in this last post, you do have some valid points. As long as you insist on such muddles, you will never persuade the ‘apostles’ that their concept of the 2nd Law is wrong. Nor will you even be able to make them look silly for insisting on it. All you will accomplish is showing off your gnostic inturpitude. So I am glad that you are not the one rewriting the concept of the ‘scienceofdoom’ post, soon to appear as “Intelligent Materials and the Imaginary Second Law of Thermodynamics”. BTW: your accusation of claiming ownership of the thread rings particularly hollow after your own transparent attempts to dominate it. Give it up. As for me, I am going to sit back now and wait for the improved version of the post. If you take away the source it also goes away, I think that is more relevant. There are effects, including reflection, and scatterings, where the direction that the final incident radiation is coming from does not indicate its source, in the sense required by the 2nd law. The flux of heat associated with blue skies, clouds, or metallic surfaces, does not come from these intermediatories in the sense we require. They are not the source of that heat. They are not losing energy in the process, it is the source that is losing energy. I do not think, I am making an error here, which you seem to claim. BTW (and moderators note), I do not like to characterise others, but I feel you do. I can not be sure, but I take it that “gnostic inturpitude” was meant to be highly insulting. Well what can I say, though familiar with “turpitude” (as meaning depraved, vile, base, shameful), which is a massive insult, I could only wonder what inturpitude might mean, well perhaps it means whatever you think it means as it does not appear to be a dictionary word. I expect that the phrase that you wanted was “gnostical turpitude”. So I expect you meant to be very insulting. But then “gnostical turpitude” is I believe a fictious crime, but whatever, I take it as an insult of the first order. As I say, I do not like to call people names. I think characterising someone, their thoughts, or their beliefs, as in anyway, DEPRAVED, VILE or SHAMEFUL, is at the upper end of personal insults, and certainly well beyond the limits of what I would consider appropriate etiquette. Look, I do not call you names. I certainly do not cast doubt on your morals. Kindly retract that statement, and stop doing it. Please consider the etiquette in your posting. Perhaps you didn’t mean to be insulting but it appears that you do to Alex and probably to anyone else if they knew what the term meant. By definition, at a space point the vector irradiance points toward this space point while the vector radiosity points away from this space point. At a space point, the radiative heat flux is the vector difference of the vector radiosity and vector irradiance. The radiative heat flux is bound by the second law of thermodynamics. Neither the vector radiosity nor the vector irradiance is bound by the second law. With use of the terms “vector irradiance” and “vector radiosity,” there are not two second laws, one real and one imaginary but only one second law. Use of the two phrases can be illustrated by the case of a pair of disks whose axes are collinear and which are black body radiators. Disk A has temperature TA. Disk B has temperature TB. TA >= TB. The distance between the opposing faces of the two disks is small by comparison to the radius of the two disks. Now consider Point A; it lies at the center of Disk A and in the surface of Disk A that opposes Disk B. At Point A, the vector radiosity points toward the center of Disk B; the magnitude of the vector radiosity, the “radiosity” is sigma * TA^4. At Point A, the vector irradiance points toward the center of Disk A; the magnitude of the vector irradiance, the “irradiance,” is sigma * TB^4. At Point A, the radiative heat transfer is a vector that points toward the center of Disk B; its magnitude is sigma * (TA^4 – TB^4). This magnitude is identical to the radiosity minus the irradiance. The radiative heat flux is bound by the second law of thermodynamics. Neither the vector irradiance nor the vector radiosity is bound by the second law. No distinction need be made between a “real” second law and an “imaginary” second law. on July 11, 2010 at 11:33 pm | Reply Matt J. Then can you explain the energy fluxes in Trenberth’s famous diagram, the one just below the text of the abstract at http://www.cgd.ucar.edu/cas/abstracts/files/kevin1997_1.html, in your preferred terms, “heat flux”, “vector irradiance” and “vector radiosity”? Trenberth’s diagram makes a degree of sense if and only if: a) the arrows that are associated with electromagnetic radiation and that point downward are interpreted as examples of vector irradiances and b) the arrows that are associated with electromagnetic radiation and that point upward are interpreted as examples of vector radiosities. Under these interpretations, at a space point the vector difference of the vector radiosity and vector irradiance is the radiative heat flux. Contrary to these interpretations is a Web page at the site of Trenberth’s employer, the University Corporation for Atmospheric Research. In this Web page, each arrow in Trenberth’s diagram is identified as a “heat flow.” If it is a heat flow then the arrow which is associated with the “back radiation” violates the second law of thermodynamics by flowing up a temperature gradient without being pumped. You just have to read the paper to find out that this is exactly what is meant. The energy budget for the global annual mean is determined by the net radiant flow of energy at different wavelengths through the top of the atmosphere and at the earth’s surface. 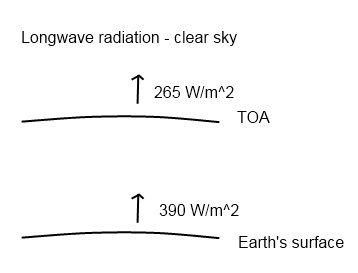 At the top of the atmosphere, net energy input is determined by the incident shortwave radiation from the sun (insolation) minus the reflected shortwave energy. This difference defines the net shortwave radiative flux at the top of the atmosphere. To balance this inflow of shortwave energy, the surface–atmosphere system emits longwave radiation to space. This seems pretty clear. And in their paper they do point out that they have assumed that the earth is in energy balance, i.e. not accumulating or losing energy, and they explain their reasons for doing so. Why is there any confusion about what this diagram represents (for people who have read the paper that this diagram summarizes)? on July 12, 2010 at 5:04 pm | Reply Matt J. Perhaps there is no such confusion for — as you point out — people who have read the paper. But the problem is that Trenberth’s diagram is widely cited and copied, so that far more people see it than have read the paper. Now no doubt some will respond with the snooty rejoinder, “Aha! So that is the problem! They just have to learn to read the whole paper before jumping to conclusions”. But such a rejoinder would itself be based on a very unscientific assumption concerning the nature of human communications. Especially since it is scientists themselves who are quoting Trenberth’s diagram this way, ripping it out of the original context, so that the VAST majority of readers have no chance of reading it in the original context. Politicians and PR types work very hard at learning to speak in a cagey manner, so that it is hard to quote them out of context to get something the opposite of what they mean. Yet obviously even they fail at this often enough to be a problem for themselves. Trenberth never did learn to work that hard at it (as this case makes clear), and his diagram has been quoted out of context to support the opposite of his conclusion a lot now. Yes, I blame a lot of the sticking power of the “false version of the 2nd Law” on Trenberth’s diagram. Thank you for providing me with the opportunity to comment. I am unable to tell you WHY there is confusion but am able to report that there IS this confusion and to recommend a workaround. I’ve already issued my recommendation to you on a workaround. In this context, you’ve raised the issue of what could be wrong with the Kiehl-Trenberth type of diagram. It enters the picture as a result of the practice by some authors of labelling the vector irradiances and vector radiosities of this type of diagram as “heat flows.” There is an example of this usage at http://www.windows.ucar.edu/tour/link=/earth/climate/greenhouse_effect_gases.html . Among these “heat flows” is the vector irradiance that is associated with the “back radiation.” This vector irradiance points up a temperature gradient. In calling this vector irradiance a “heat flow,” UCAR’s description of “The Greenhouse Effect” violates the second law of thermodynamics. If UCAR had labelled this vector irradiance as a “vector irradiance,” there would be no such violation. An alternative to the workaround which I recommend is to agree that the word “heat” and phrase “heat flow” have different meanings in meteorology/climatology than in engineering and the physical sciences. Under this alternative, the neologism called the “net heat flow” references the concept in meteorology/climatology which, in engineering and the physical sciences, is referenced by the phrase “radiative heat flow” while in meteorology/climatology the phrase “heat flow” references a vector irradiance or vector radiosity. This alternative does not seem to me to have merit for it fosters the very confusion which I have reported to you. As the topic of “the greenhouse effect” is heat flows, confusion over what one means by “heat flow” is particularly damaging to communication about this effect. Either it’s your sophistry, in which case you are a con artist, or it is your stupidity. Either way that example has absolutely nothing to do with anything anyone calling on the 2nd Law of Thermodynamics to refute the Greenhouse Effect would say! It is a challenge to grab hold of the many varied and contradictory ideas that people hold to refute the “greenhouse” effect due to alleged problems from the second law of thermodynamics. Such a wonderful array of ideas have been presented at this site. Not a single one with an equation or a calculation of entropy. Textbooks on heat transfer ignored. It’s a wonderful study. The Three Body Problem – a simple example with three bodies to demonstrate how a “with atmosphere” earth vs a “without atmosphere earth” will generate different equilibrium temperatures. And entropy calculations to prove the second law is not violated. Kramm & Dlugi On Illuminating the Confusion of the Unclear – Kramm & Dlugi step up as skeptics of the “greenhouse” effect, fans of Gerlich & Tscheuschner and yet clarify that colder atmospheric radiation is absorbed by the warmer earth.